What Are The First Steps In Building A Successful Digital Marketing Strategy? A successful digital marketing strategy has many components including website design, search engine ranking, social media, PPC and more. Within those components lies the core of your digital marketing strategy: Crafting ad campaigns, performing keyword research, writing engaging content and so on. Each of these elements will help you to build a successful digital marketing strategy. This is the very first step of any digital marketing strategy. If your website isn’t user friendly, your other marketing efforts won’t be as effective. Your website should be visually appealing and easily navigable. As well, your website should be built to encourage conversions, and be responsive to all devices. Once you’ve ensured your website is user-friendly and responsive, you can begin implementing tactics to drive your organic traffic on search engines. This will require research into the keywords or phrases you hope to rank for, and how you can optimize your content to drive traffic through SERPs or backlinks. As well, you can write content, such as blogs or infographics, that will further drive traffic to your website. Landing pages are often the first impression a user has of your website. These are the pages a user lands on after entering a search term or phrase on a search engine. It’s crucial that these pages be user friendly and include a strong call-to-action. As well, you should treat these pages as a pitch for a product or service you offer. Social media marketing is an important aspect of your digital marketing strategy. You’ll be able to achieve a personal interaction with your audience through social media, and grow your platform through these channels, which will ultimately assist your other online marketing efforts. 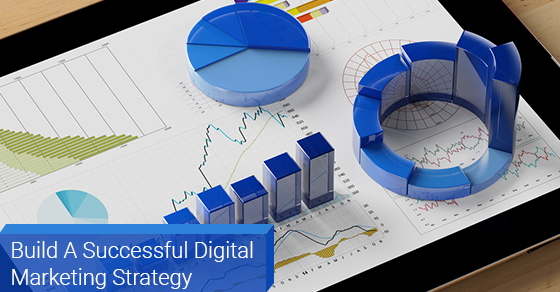 Measuring your digital marketing strategy is what makes it successful. Without tracking your progress, you won’t able to differentiate between what’s working and what isn’t. It can be difficult to form predictions about your users and future success without tracking and measuring, as many uncontrollable factors can cause a change in your digital success, such as a search engine update, seasonal factors, special offers and more. Above are some of the first steps you should take toward your digital marketing strategy. Crafting an effective digital marketing strategy takes time, and some trial and error. However, keeping the above tips in mind will ensure you get off on the right foot.